Page 10 of 10 pages. There are some valuable advantages in having a rear projection screen especially when owning more than one projector. The first advantage that comes to mind, after the obvious one of avoiding distortion, with at least one of the images, is the opportunity to add a light coloured background when photographing projected images on to other objects. For example when creating a picture such as plate 11 (Page 2), the way of avoiding the portrait from being seen behind the feather, was by having a large dark space beyond the feather. Then only the image focused, on to the feather, could have been seen the parts that missed the feather were lost out of focus in the dark area beyond. It would not have been possible to mask the image to the feather had a light surface been close behind it. That is why many of these pictures have very dark backgrounds. Should a lighter background scene have been favoured, it was not with the feather picture, but had a background scene been required it could have been added by rear projection. The rear projection screen would have been placed a distance beyond the feather so that the portrait image reaching it would have been out of focus and darker. Some masking would also have been used to help keep the brightest parts of the portrait off this screen. Then by rear projection any picture could have been added to form a background. Should the rear projection screen simply be used to provide a background scene, often expected to be in a softer focus, an expensive screen is then not needed. Even tracing paper will do. 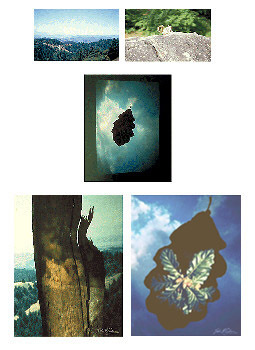 Take a look at plate 33 (above) the slide of the squirrel was projected on to an old broken piece of wood. Behind this piece of wood a country scene is projected on to tracing paper, by rear projection, and then photographed as seen. Plate 34 (above), was created in the same way, an old leaf was stuck on to the tracing paper and a transparency of acorns projected on to it. The sky scene was then projected on to the tracing paper and photographed as seen. Hoping that readers having reached this far will agree that the possibilities described, offer photographers working in colour so much more than simply recording reality. Trusting readers will also agree that this form of photography really justifies recognition in the art world, as it has certain qualities that are quite unlike those of any other media. This has been published with the hope that photographers will not just create strange pictures or gimmickry, but produce works of true artistic merit. The most satisfying time spent is without doubt in the creation of the work. Frequently regardless of the medium used, if an artist is truthful, the end result obtained is not always exactly as initially conceived. Often the author has decided on a theme, or it could be just a thought about a pattern or composition that exists in the mind, in an abstract way, as yet unexpressed. Perhaps the last portrait taken inspires the desire to do more with it. Whilst considering and projecting certain images, to blend with such a portrait, something can suddenly be seen that fires the imagination. At other times an idea occurs and a clearly defined image forms in the mind. However, whilst trying to create this picture, it is not so unusual that one strays across a certain amount of accidental inspiration. This can be the chance blending of two images in a way never thought of before, that looks just too good to ignore! The best thing to do then is to be prepared to change direction, and pursue the new study, rather than the original concept. The first attempted creation can always be tried again later on. The excitement and pleasure one feels when inspired in this way is hard to describe. So even if one starts with just the vaguest of concepts, it is worth spending some time experimenting. Think of it as being the stage where the artist is selecting and mixing the paints on his palette, still unsure of what he might paint, but just feeling the need to make a start. Whilst thinking of the various possibilities, surprising relationships can develop, that might well become the basis of the final picture. It is only really by actually making a start, that you create the opportunity for something exciting to happen.